Last May, we launched free Community accounts on ScraperWiki. We’ve since found that the limit on number of datasets isn’t enough to convert heavy users into paying customers. This matters, because we want to invest more in improving the product, and adding new tools. 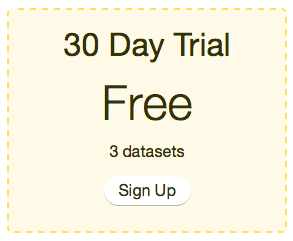 Today, we’re pleased to announce that we’re introducing a new Free Trial plan. This replaces the Community plan for new users, and lets people try out ScraperWiki for free for 30 days. Existing Community accounts will stay free forever, as a thank you for supporting ScraperWiki early on. We may, however, add new features and tools in future that won’t be available on Community accounts. We continue to support journalists, if you are one then just ask for a free upgrade. If you have any questions, please do ask in the comments below, or email me, the CEO, at francis@scraperwiki.com.